HS Restoration knows that cleaning hardwood flooring can be a difficult task, full of all types of challenges. 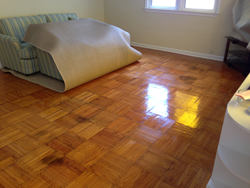 We know how to properly clean and seal all types of wood flooring. We have over 30 years in the floor maintenance industry and we use that knowledge to clean wood flooring without the mess of sanding the finish. Clean and dust free! HS Restorations uses state of the art hardwood high Speed Rotary Brush cleaning system, that allows us to reach tough dirt and contaminates buried deep in the floors surface. We use only the best cleaning solutions on the market. After our IICRC Certified Technicians clean your floors, we use a high powered vacuum to extract both dirt and the extra cleaning solution, leaving a smooth and dirt free surface, ready for the protective finish in your choice of either matte or gloss. At HS Restoration we take flooring protection to a whole new level. After your hardwood floors are clean, we apply a fast drying maintenance coat of protection that extends the life of your flooring leaving it with a uniform shine and moisture barrier. You choose the type of protection, matte or gloss. Dry time is minimal. Crawl space was damaged during the storm. Water never made it into house. Floor was damaged by mold and moisture that formed in home from water left in crawl space after the storm. Insurance would not cover the damage. 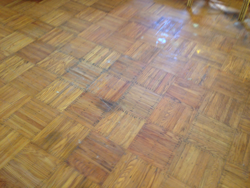 HS restoration was able to remove the mold and moisture and restore the wood flooring. Saving the homeowner thousands of dollars!